I have been selling my patterns and handmade items online almost four years now. However, I have never attempted to sell at a craft fair. 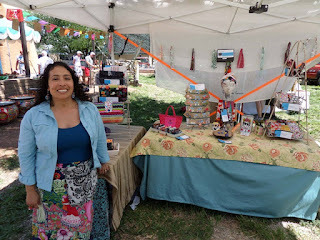 That's why I am so pleased that my friend Diana from joliefemme is back to share her experience and advice about selling handmade items at festivals and fairs. How do you find and choose what craft fairs you sell at? I have found lots of support online with my NewMexyEtsy team to let me know about local shows or searching online can also get results. There are many holiday shows held indoors at local schools that are reasonably priced and well known so people come back from year to year. Indoor school show customers can vary from those who expect to pay very low prices to those who understand handmade art and craft and will pay what it is worth. You can only learn by attending them as a customer or a vendor to see if they are a good fit. If you have a relationship with the organization or local store putting on the show you can usually build a following of customers and have customers expect to see you there each season. What is the average fee? Are you able to make enough profit to cover the fee? The fees can range from $25 to $ 250 depending on the show/street festival or length of time, one day or up to a week at some shows. Profit varies from venue to venue and year to year and weather is also a factor. This year has brought many wind storms and essentially shut down the chance for sales at outdoor shows. But when it is nice weather and good attendance you can really sell well. How much inventory do you bring? I never bring all my inventory to a show and usually tailor certain lines to certain shows. For example, I bring Dia de los Muertos themed items to a show that I do in the summer each year and a different selection to shows depending on their themes. Holiday season shows get holiday themed items. 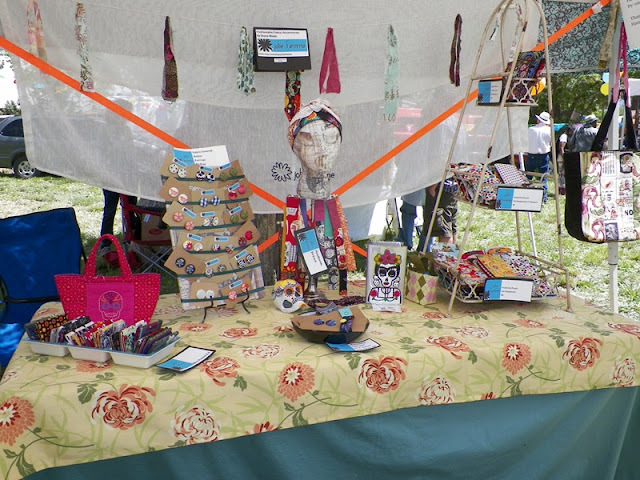 How do you handle your Etsy inventory while you are at the fair? Sometimes I close the shop if it is an out of town venue or a full weekend show but if it is a day long or half day show I will leave my shop open and deactivate any listings I bring along. You can also use the Sell on Etsy app to remove items as they sell at the show. Has your participation at craft fairs led to custom orders or sales on Etsy? Yes, I have had repeat customers from certain local venues. They have wanted to order an item from my shop since they couldn’t make it to the show. Or custom order have also been generated by those customers who are local and do not mind waiting for an item to be made especially for them. How do you process payments? Do you have a credit card reader? I take cash and sometimes checks at local venues depending on how familiar I am with the customers. But usually use the Square Pay System to process credit card payments. What do you bring with you besides your inventory? Depending on the show, there is different set up required. If it is an outdoor show, I bring a pop up tent, tables and display racks. I have been accumulating different gear over time. I have found that garden décor items can work well to display my wares. I always bring price signs and product displays such as shelves and baskets. It’s also nice to bring cloth to make a backdrop or decorate the outside of the tent. This helps turn the tent into a nice shop atmosphere for customers. When weather is a possible issue there are many more accessories required such as tent stakes, tent weights and rope. Do you have any other helpful tips or resources for people interested in selling at craft fairs? I have found support on Etsy with a team called Craft Fairs…It’s a Living. Their threads are full of advice and support for established vendors as well as beginners. Also Etsy local helps Etsy sellers let their customers know about craft fairs they are in. You can't reach it from your shop dashboard or even the bottom of the page or homepage, so make sure to bookmark it, https://www.etsy.com/local. On Pinterest and in the blogosphere there are also many helpful posts and ideas on displays and equipment to be found.